» White Paper: Wie verbessert man die Rendite bei Kabelinstallationen? Durch Sparen von Zeit. White Paper: Wie verbessert man die Rendite bei Kabelinstallationen? Durch Sparen von Zeit. The old adage, “Time is Money,” applies in a big way to cable testing. Over the last 25 years, advances in testing and certification tools and technologies have benefitted the enterprise cabling installation industry significantly—link certification times have been reduced to just a few seconds, shaving testing and certification costs for installers. Still, there are additional steps in any installation that consume valuable time, producing added costs. New breakthroughs in cable testing approaches help contractors reduce time dealing with testing and reporting issues by more than 50%, adding up to 10% to overall profit margins. In total, these sorts of problems cost installers over 40 hours on a typical 1,000 link job. This all suggests that, if these problems are rectified and then avoided in the future, the resulting additional profits would mean more revenues for cable installers, or if they choose to pass along their savings to prospective customers, more competitive bids. In another survey, US installers reported that they spent 63% of their time actually installing cable. After completing the installation, 14% of typical project times involved testing-related tasks, six percent went to reporting, eight percent to re-work, and nine percent to contingencies and other activities. The non-installation parts of the job: testing, reporting, re-working and troubleshooting represent fertile ground for cutting costs through the deployment of testing systems with expanded capabilities. Eliminating testing mistakes caused by inexperienced workers, avoiding delays caused when less experienced installers are idle and waiting for help from more experienced staff, reducing errors during planning and setup, condensing time on troubleshooting, reducing the need for retesting, ending unnecessary job travel time, and streamlining inefficient reporting processes were all cited by companies as actions that can reduce costs and increase profits. In the field, installers utilize a number of approaches to minimize mistakes. One such method is hiring more skilled employees, but workers with quality understanding of the nuances of cable and fiber testing are rare. 78% of Fluke-surveyed owners report that finding good workers is a challenge. More training for inexperienced employees can certainly help – Fluke Networks has trained over 10,000 technicians in our Certified Cabling Test Technician (CCTT) program. But training is also expensive, with classes requiring a tuition charge and time away from jobsites. Any necessary travel only adds more cost. Regular turnover is another prohibitive factor. The job-driven nature of the industry creates a steady inflow and outflow of temporary workers. This can mean investing in a worker who could be working for your competitor next month. And even highly-experienced product managers can't prevent all problems. While it’s true that more than 80% of installer owners report that project managers ensure things are done right, the nature of today’s cable installation business makes this increasingly tough to do. Most project managers work on multiple jobs simultaneously, and single jobs require installers to move from floor to floor and wait for construction teams to finish other parts of the job. 70% of installers report moving a tester back and forth from one job to another at least monthly. It’s unlikely that such overworked managers can ensure that every tester on every job is always set up and used properly. For all of these reasons, a better approach to a better bottom line is to design testing systems that leave less room for error and thus increase overall job efficiency. Examples of such errors are widespread - almost half of the more than 800 surveyed installers worldwide reported having to retest links because they were tested to the wrong limits. 37% percent also reported dealing with negative loss fiber measurements, which is like recording a negative time in a 100-meter dash – something obviously is incorrect! Fluke Networks has adopted a two-tiered approach to eliminating these problems and improving contractor productivity. The first is to design testers in a way to make the technicians more efficient. The second is to design a system that allows project managers to, well, manage cabling project certification like never before. Managing the testing of multiple jobs with multiple teams, testers, and requirements is time consuming and a source of errors. Increasingly larger jobs make project organization more important than ever. Instead of setting up individual tests, users create complete project files with all job specific details. This eliminates the need to re-enter job specific details when changing a project, eliminating set-up errors. A single project file can be shared among multiple testers, further speeding set up and reducing the chance of errors. Building more automation into the tester can prevent a lot of common set-up problems. For example, negative fiber loss readings result from improperly setting reference levels – a relatively complex process. Mistakes in this process can make every subsequent reading incorrect, resulting in an entire “re-do” of the job. To solve this problem, the tester itself can lead the operator step-by-step through the process and check that each has been done correctly. The sequence of Fluke Networks device screens below shows some of the steps in the process. As each is completed, the user taps “NEXT”, the tester verifies that the step was completed, and then presents the next step. According to Fluke Networks customers, another step in the cable certification process that requires more time than necessary is troubleshooting problems. According to more than 300 contractors in a US survey, 8.4 hours on each job are wasted waiting for a lead technician to troubleshoot. We worked with our technical support team (with combined experience of 162 years in cable testing) to put their knowledge into the instrument. The result is the FAULT INFO feature, which turns every tech into an expert by providing simple analysis of even the most confusing cabling problems – with a single touch. Detailed fault information turns everyone on the team into expert troubleshooters. The project manager or lead technician can’t be there to supervise every test on every job. That's why Fluke Networks developed LinkWare Live™, a cloud based service that allows management of certification jobs anywhere with anyone on any device. The result is better visibility into projects, and fewer profit-cutting mistakes. As noted before, improper setup of testers can be costly. With LinkWare Live, project managers can set up all the parameters of a project from cable ID’s to fiber loss limits from their office on any device with a web browser. Technicians in the field connect their testers via Wi-Fi to the cloud service and then download project settings, eliminating the opportunity for mistakes. As teams complete their testing, they upload results to LinkWare Live directly from the jobsite. This eliminates time spent driving testers back to the office, and the project manager can track the progress of his teams wherever she is from her PC, phone, or tablet. More importantly, LinkWare Live automatically flags any unexpected tests. This allows the project manager to find problems early in the process before too many incorrect tests have been completed. LinkWare Live can even show where the testers are on a map, helping track these expensive assets. LinkWare Live can track the status of testing jobs, warn of unexpected tests, and even show the last-used location of testers. With multiple testers on multiple jobs, it’s no surprise that tracking down testers and consolidating results takes over three hours on a typical job. But with LinkWare Live, test results are uploaded to the correct job, so creating a report is a snap. No hunting for testers, and no driving them back to the office to download results. Fluke Networks interviewed companies that used mostly Versiv systems, companies that deployed some percentage of Versiv devices, and those that had no Versiv products. We then compared the efficiency of Versiv cable testing system users against shops with a mixture of devices and no Versiv systems. 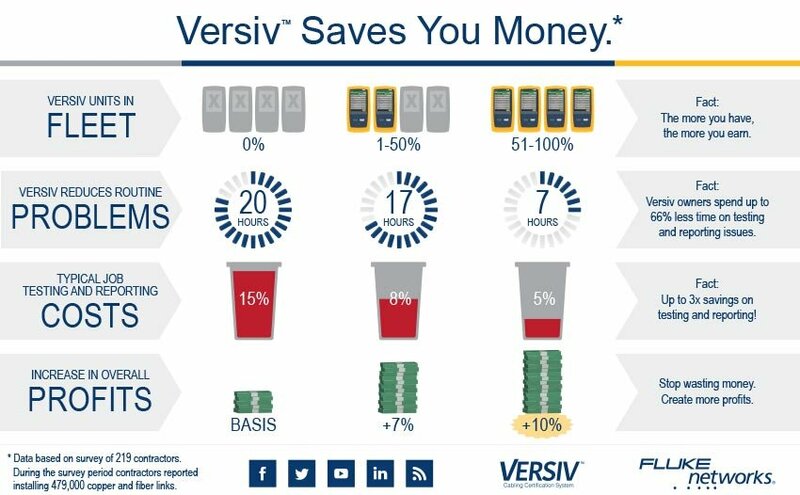 Overall, Versiv owners spend up to 66% less time on testing and reporting issues. The findings show that total time spent on testing and reporting goes down from 15% to 8% to 5%, adding 7% and 10% to overall profit margins as Versiv penetration increases from 0% to 50% to 100%. Saving time saves money, and that's good news for everyone's bottom line.